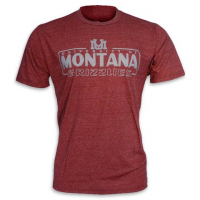 Show your Grizzly Pride with the University of Montana `Griz Nation` Dyed Marble S/S Tee that features superior comfort and style with a cotton/poly blend allowing for excellent moisture management. Go GRIZ! 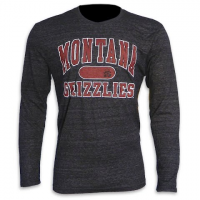 Show your Grizzly Pride with the University of Montana `Montana Grizzlies` Triblend L/S Tee that features superior comfort and style with a poly/cotton/rayon triblend allowing for excellent moisture management. Go GRIZ! 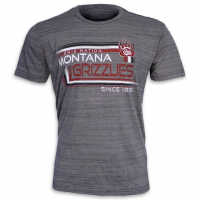 Show your Grizzly Pride with the University of Montana `UM` Armguard Triblend S/S Tee that features superior comfort and style with a poly/cotton/rayon triblend allowing for excellent moisture management. Go GRIZ! 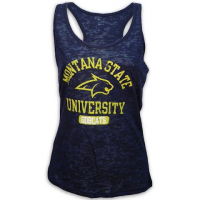 This sublimated tank for women features a classic Montana State Cats logo and is ultimately comfortable for wear just about anywhere! 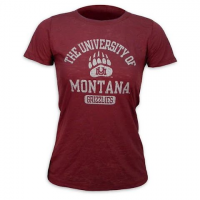 This sublimated tee for women features a classic University of Montana Grizzlies logo and is ultimately comfortable for wear just about anywhere!